New Jersey Gov. Chris Christie's nomination of Sohail Mohammed to be a state judge shows the governor's tin ear for radical Islam. Not only did he appoint a longtime mouthpiece for radical Islamists to be a judge, but Christie has also turned a blind eye to the activities of one of Mohammed's clients – radical imam Mohammed Qatanani, head of one of New Jersey's largest mosques. MOHAMMED: Well, you cannot call them -- and anybody who professes or who says that he believes in a religion, a peaceful religion, cannot take the banner and crash a plane, and you blame every single person who follows this faith. Christie's support for Islamists such as Qatanani and Mohammed betrays either naivete or calculation. Either is troubling. Don't particularly like Christie but this seems like a real witch hunt and gossip. I applaud Christie who stood-up to these Islamiphobes. This is the guy that's on the short list for Mitt's VP, remember that. 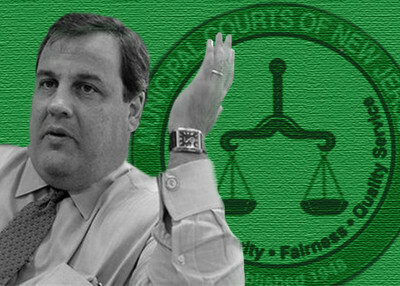 Christie manipulated the Judiciary Committee for this appt. Gentlemen/Ladies; I am a former NJ State Senator very well known for exposing corruption in this state for the last 15 years. Gov. Christie is aware of who I am. As the Former NJ U.S. Atty, I sent numerous letters to him containing information about corruption. He noted that during a speech in Southern Jersey. As such when I requested formal permission to testify at the Judiciary Committee hearing re: the Sohiel Mohammed appointment, I was never called. I had been a member of the Judiciary Committee. They cancelled the hearing at which I was to speak and then held it while I was away. They claim they forgot to call me and apologized. I did not accept the apology and told the Committee Aide it was deliberate, not an oversight. There were a few who testified against Sohiel Mohammed. However, all of the NJ Press knows of my background and my testimony would have carried weight. I am very unhappy with this nomination but even more disturbed at Christie's response calling those against Mr. Mohammed "crazies." I submit that Gov. Christie actually knows very little about Sohiel Mohammed; even less about the structures of Jihadist leaning organizations. Thus, Christopher Christie has unwittingly or deliberately aided and abetted Jihadist- leaning organizations. It makes perfect sense, that when an individual is accused of terror activities in N.J. their atty will chose an Islamic leaning N.J. Judge. This is such frustrating and disappointing news. I have had a very high opinion of Governor Christie but this has knocked it down by at least 50%. If he doesn't have the wisdom to know who our enemies are - whether they appear to be peaceful or not - then he certainly doesn't have the wisdom to lead this country in any capacity. I'm sorry for this. This type of ideology is leading our country down the wrong path and is every bit as dangerous as the foolishness currently going on in Washington. So sad.